Over the coming weeks, 2nd year Computer Science & IT students at NUI Galway will have the opportunity to collaborate with students in Spain (Barcelona), Germany (Berlin), New Zealand (Auckland) and the UK (Salford) on the iCollaborate or #icollab project. The project, now in its third year, is described by Helen Keegan as “a community of practice where… students work together on creative social tech projects that cross disciplines, levels, time and space.” I’m delighted to be joining Helen, Mar Camacho, Ilona Buchem, Thom Cochran and Averill Gordon — and our students — in participating in #icollab. Our CT231 class at NUI Galway will be bringing Ireland into #icollab for the first time. As the Galway group’s first foray into sharing across those boundaries, CT231 students are posting their Ignite presentations online (via the CT231 Student Showcase), inviting feedback and conversation. In a Google+ hangout last week with NZ colleagues, Thom and Averill asked me if CT231 students would also be willing to post videos of their presentations, as another means of students connecting and sharing. The following day we did a trial run of this in class using the Bambuser app. 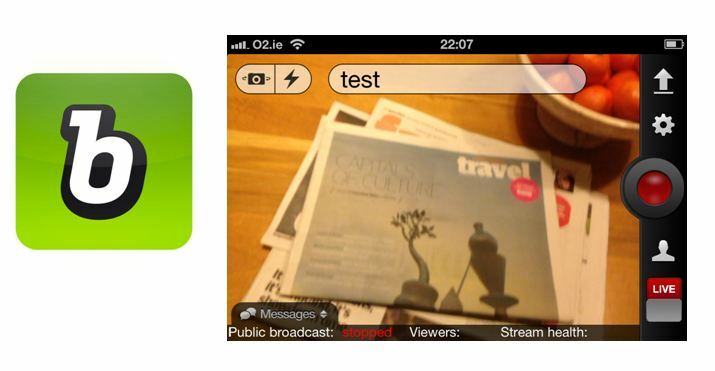 Bambuser enables live video streaming from mobile phones or webcams. Using the app is simple: one click opens the app, one click records and streams (in public or private), and one click stops recording and uploads to the user’s Bambuser page. Once posted on that page, others can view the video and add comments. One of our student presenters agreed to be filmed this week so that we could trial the app and learn how best to use it for recording presentations (thanks, Jack!). The experiment was a success and we learned some valuable tips for future recordings. After sharing the video via #icollab, feedback from New Zealand was available to us the following morning (thanks, Thom!). We look forward to extending the collaboration with students in the coming weeks. Right now I’m looking forward to the next weekly Wednesday night Google+ hangout with Helen, Mar, Ilona, Thom and Averill and discussions with my students the following afternoon, as we collectively create the terms and the vision for #icollab 2013. Thanks for the heads-up on that, Iain — I found the link: http://www.microsoft.com/liveatedu/office365-for-education/case-studies.aspx Our project will be less structured than this one, but we can certainly learn from their experience. Will get in touch with Murray 🙂 thanks!